Call it cottage, villa or vacation rental: We built it as a home on the sandy beach of Lake Erie close to the border between Ontario and Michigan. Families enjoy the waterfront and love-birds the moon over Lake Erie! Lots of space for family reunions or a family vacation. Our guests have come from United States, Canada, Asia and Europe. They told us they enjoyed their stay in the "house on the beach".. 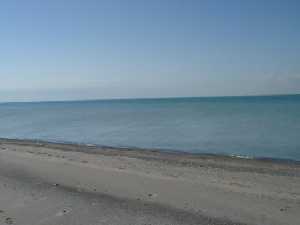 Welcome to Argyle Beach: an excellent vacation rental in Harrow, Ontario, Canada! Enjoy the many glorious faces of Lake Erie from sunrise to sunset. This is a perfect setting if you are searching for a place to get away from it all, but do not wish to be far away from everything. A moderately priced vacation rental home in the most southernly part of Canada on the shore of Lake Erie not far from Detroit, Michigan. Enjoy amenities that transcend conventional cottage dimensions. We have our own private sandy beach! See description of the house on the beach. Read what one of our guests wrote after returning home from the "house on the beach": "This house is wonderful! The pictures just can't do it justice." 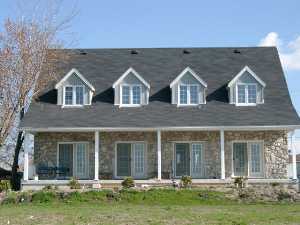 Five bedrooms and two bathrooms with more than 2000 square feet ensure enough room for up to 10 guests. We built this house in 2002 to suit our own tastes. It is not an impersonal lodging facility, it is a home. Pine floors, oriental rugs, the view of Lake Erie and the soothing sound of the waves make it a perfect get away. Perfect for family vacations and family reunions. See prices and dates for rental. Why rent a cottage when you can have a huge vacation home for the same price? We think that our rental rates are very competitive. Find out what you can do in the area. Swimming in the lake and sunbathing on the beach are just two of the pleasurable pastimes you can enjoy. Families have liked it, seniors have loved it, you will enjoy it too! 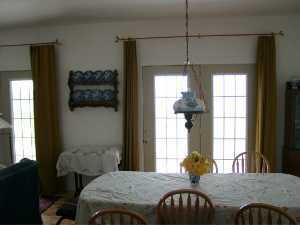 Find out when our house is available for vacation rental. More photos? Where is Argyle Beach? Not too far away from our house you will find Morris Stables where you and your family can enjoy horseback riding during your vacation. A1 Vacation Properties - Your Source for thousands of great Vacation Rental Properties from around the world.